I have such a fun DIY collection to share with you! If you have kids, or grandkids or nieces and nephews, then you are going to adore this list of 20 adorable DIY stuffed toys. You can make these so quickly and they are so much cheaper, and so much better, than any stuffed toy that you will find in a department store. These make such wonderful gifts for upcoming birthdays or for the holidays or even baby showers. The projects range from sewing to crocheting and they are all super fun. Don’t worry if you have never made a stuffed toy before. These are all so easy that anyone can do them. There is even a great DIY talking stuffed animal in here! If you are looking for a fun and inexpensive way to update your kids’ toys, these DIY stuffed toys are definitely worth checking out. They are all so adorable and you can have them finished in just an hour or so. And, while you are busy making their new stuffed toys, have your kids busy with one of these 60 Disney crafts for kids – they are guaranteed to keep them busy all summer! I have always loved making toys for my kids. There is just something so special about a homemade toy. If you have never made your kids a toy, I strongly recommend that you try it at least once. You just won’t believe the satisfaction that you get out of it. Plus, when you make your own toys, you know exactly what goes into them so you can worry less about what your kids are exposed to. And, if you do want to start making your own kids’ toys, take a look at these 30 DIY rustic wooden toys that your kids will also love. 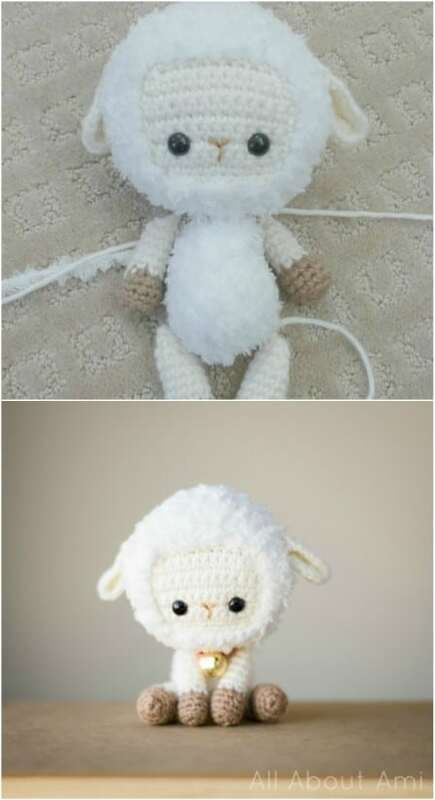 This little sheep can be crocheted pretty quickly and he is so adorable. Your little ones are going to love playing with him! This is a great crochet project if you need a unique gift for an upcoming baby shower. The actual crocheting part is really easy and you don’t need to know any fancy stitching to make this one, either. It’s a crochet project for beginners, too. You can get in some practice for future projects. Talking stuffed toys are all the rage and unfortunately, they are often pretty expensive. Plus, you just never really get the stuffed animal and the message that you want. So what do you do? You DIY your own talking stuffed animal! This is a really easy project. It takes a stuffed animal, which you can buy or make yourself and a recording device. You can record any message that you want on this one, so personalize it to match your little one! 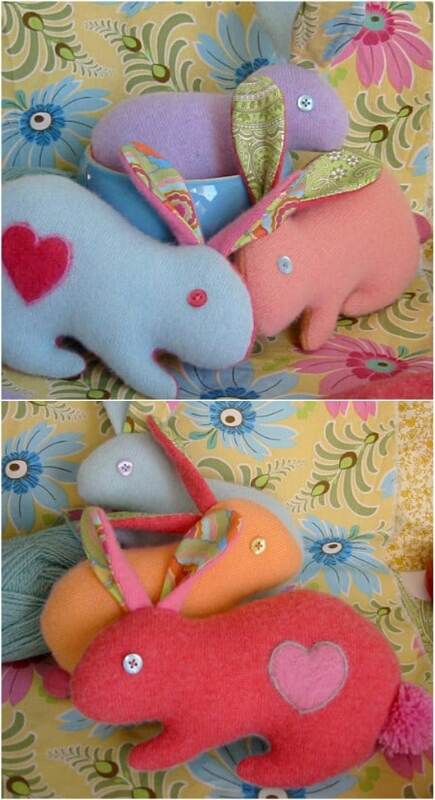 Cashmere is so soft and elegant and you can use it to create these gorgeous little cashmere bunnies. Kids are going to adore these and you will love how easy they are to make. You can make these from an upcycled cashmere sweater or scarf. If you have an old sweater that you don’t wear anymore or one that has holes or stains, this is a great upcycling project for old sweaters. And you can get more than one bunny from one sweater, depending on how big you want to make them. 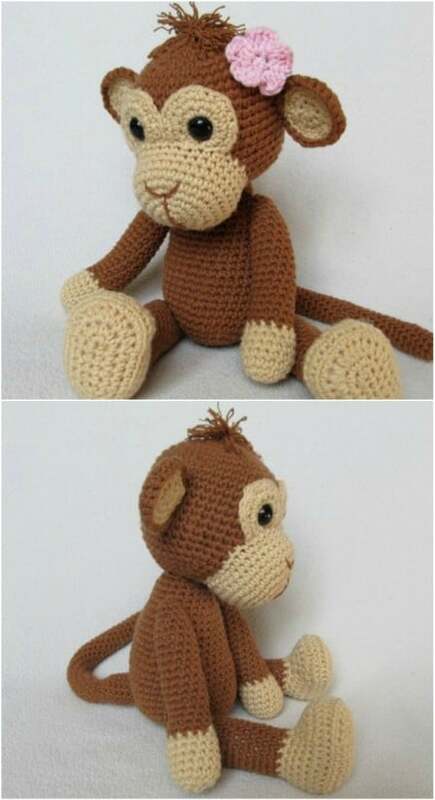 Amigurumi is a popular crochet pattern these days so I just had to share this adorable little amigurumi monkey. He is so easy to crochet, even for beginners and your little ones are sure to adore him. You just need to know crochet basics to do this one so it’s perfect for beginners. I found this pattern on Etsy. You get a PDF download for less than $5 and it gives you all of the instructions to crochet and put this adorable little monkey together. This little owl is adorable and he is super easy to sew. You can use scrap fabric for this one if you have any on hand. You don’t need a lot of fabric and the sewing process is one of the easiest that I have seen for DIY stuffed animals. You could alter the pattern just a bit to make these in different sizes and give your little ones an entire family of adorable owls! If you have never felted, you are in for a treat. This is a really simple process and you can use it to make this cute little DIY felted pig. You do this from an old sweater and the process just could not be easier. Once you have your fabric felted, the rest of the process is super simple. 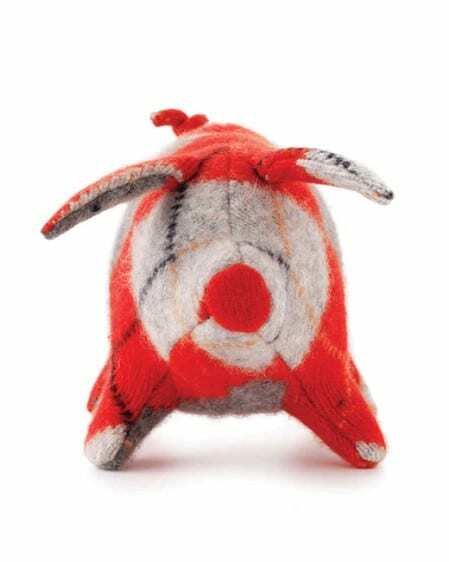 You can even alter the pattern just a bit to make this little pig in any size that you want. 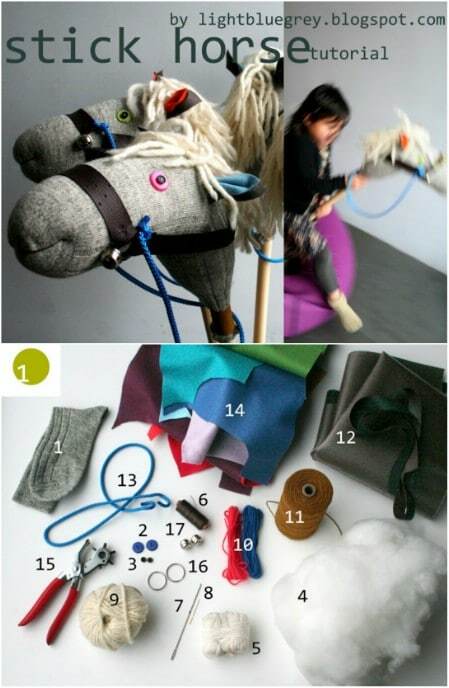 Every kid wants a stick horse and you can DIY your own for your little ones. If you have ever purchased one of these, you know that they can be a bit pricey – for the better ones at least. This one is really sturdy and it can be made with things that you probably already have on hand, like an old sock and some scrap fabric and yarn. You will need a stick and you can use an old wooden broomstick for that. Overall, this is a pretty easy project and it makes the most adorable little stick horse! 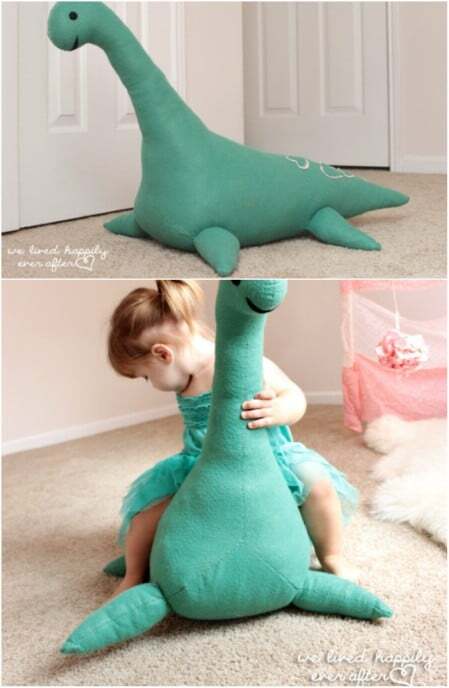 Little ones are going to love having their own sit upon loch ness monster. You are going to love how very easy this DIY stuffed toy is to make. And did I mention that he is huge? Toddlers can easily sit on top of this one and believe it or not, it won’t take you weeks and weeks to make. You will need about 15 yards of felt for the body and then some additional felt to create the details. It’s pretty easy though and so cute when it’s finished. If you are looking for a project that lets you upcycle scrap fabric, here it is. 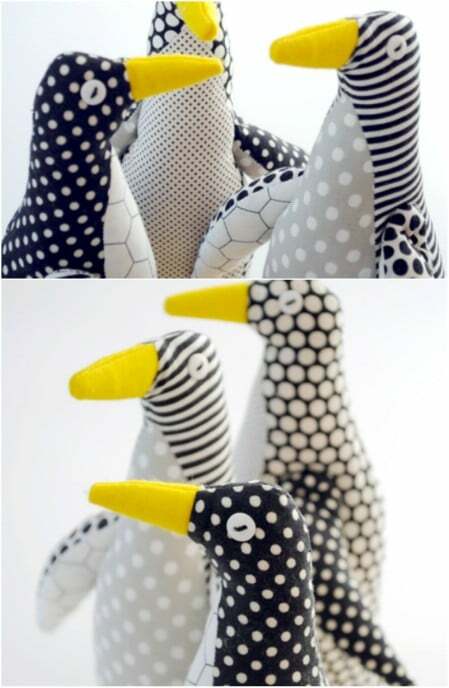 You can use those leftover fabric pieces to create these adorable little stuffed penguins. If your kids love Happy Feet or any other penguin movie, they are going to adore these little stuffed toys. They’re really easy to make and you can do them in any number of designs and combinations to create an entire little village of stuffed penguins. Use this project to upcycle leftover fabric scraps and make your little ones some new toys, too. 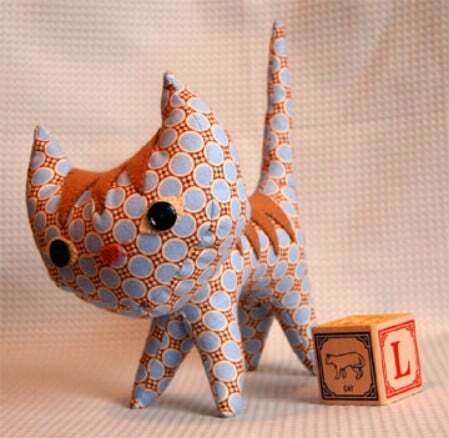 This little DIY pointy stuffed kitty is so much fun…to make and to play with. You use buttons for the eyes and felt for the other details. You can use scrap fabric to make this one if you have any or if you are buying fabric, you don’t need much. He’s a cute little cuddly kitty that your little ones will love and he makes a wonderful DIY baby shower gift, too. Every little girl needs at least one rag doll in her life and this DIY version is much better than anything you could buy in a store. 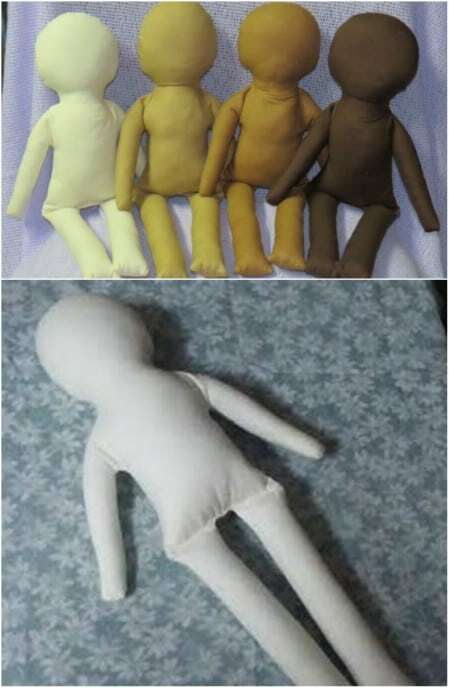 This is a really simple pattern to follow and you can make several rag dolls in just a couple of hours. Once you have them sewn, you just add the details that you want, with yarn, buttons, or anything else that you want to use to make them really special. You can nab this pattern over on Etsy for less than $2. My kids have always loved superheroes. 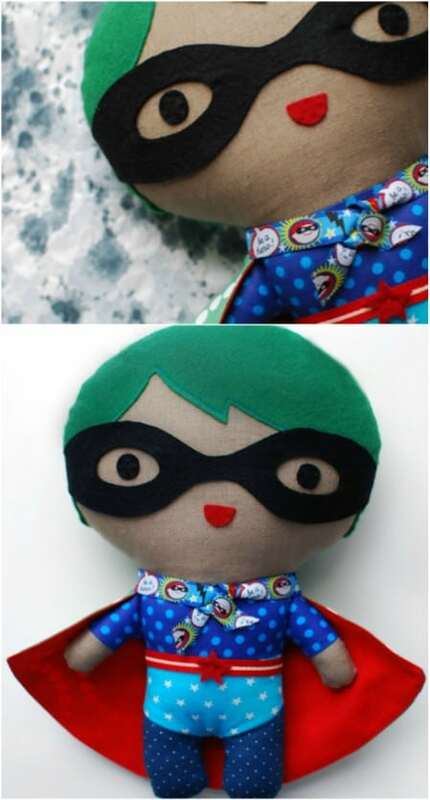 If yours do too, you can surprise them with these DIY stuffed superhero dolls. These are pretty easy to make and most of the details are done with felt. Use whatever fabrics you have on hand to make your superhero unique. These are great for superhero lovers and they make wonderful gifts for birthdays, the holidays or baby showers. 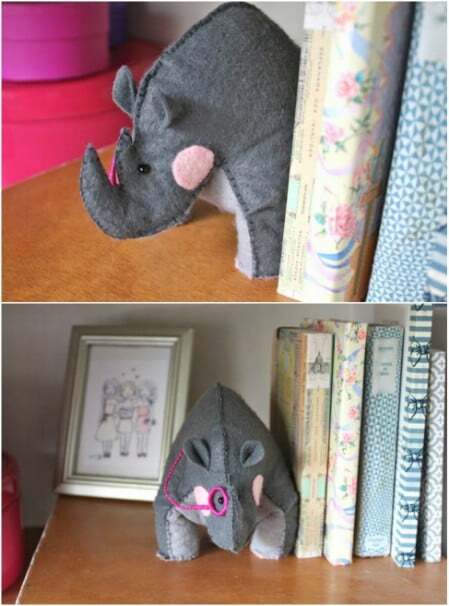 If your kids have books that need to be held in place, these DIY felt rhino bookends are perfect. These little stuffed bookends also make great toys! They’re really easy to make and you can have a set of two finished in about an hour or so. How cute would these little rhinos look on your little one’s shelf holding up their favorite books? These would make an excellent baby shower gift – just add a few books along with them. I love this DIY crib mobile that has little stuffed sheep hanging from it. If you want a great DIY gift for an upcoming baby shower, this is it. Or, just make it for your own nursery. 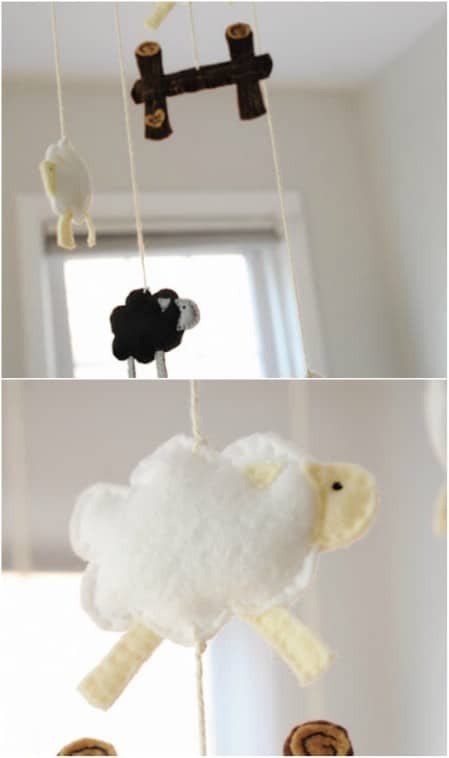 Your little one is going to love looking up and seeing these adorable sheep hovering above. This is such a simple DIY crib mobile and it’s much more special than anything you will find in a department store. This is an adorable DIY baby shower gift idea! 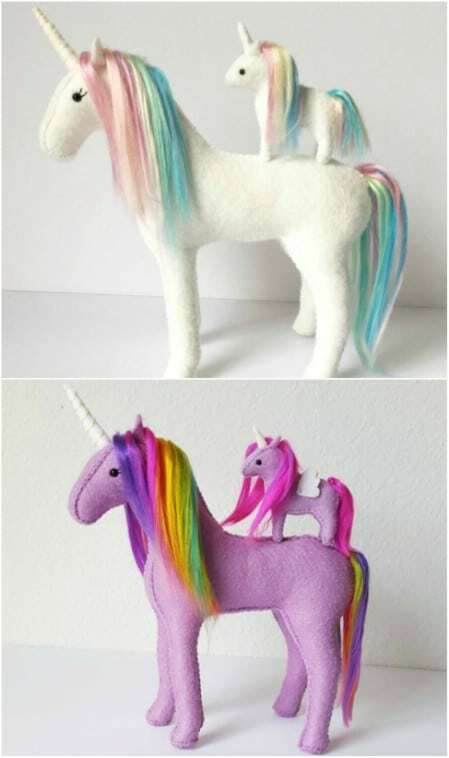 For this DIY stuffed animal project, you don’t just make one but two unicorns. This momma and baby unicorn set is so cute and cuddly and much easier to make than it looks. I found this pattern on Etsy. You can get it for around $13 and it gives you all of the instructions for making the momma unicorn and her little one, right down to the rainbow colored mane and the horn! 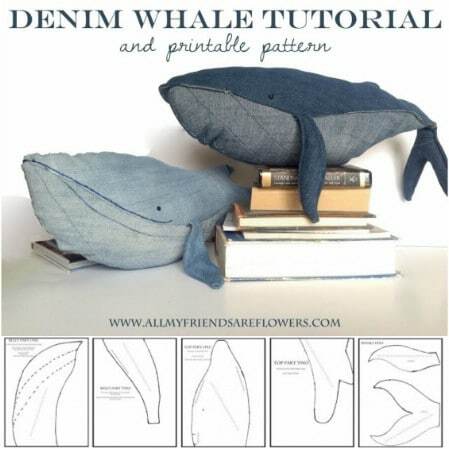 I really love this little stuffed whale that you can make from repurposed denim. This is a great upcycling project for old jeans and it gives your little ones an adorable stuffed whale to play with. You just need one pair of jeans to make one whale so if you have several pairs that you want to get rid of, you can make a handful of these and give them out to friends and family for their little ones, too. Do your kids love turtles? Mine always have which is why I wanted to share this next DIY stuffed toy project. This little family of turtles can be made in an afternoon and to say they are adorable is an understatement. 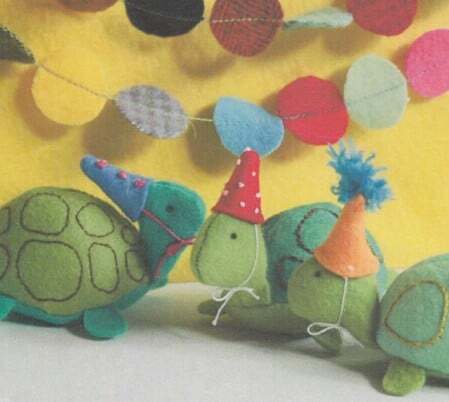 You make these from wool felt and you can make as many turtles as you have felt available. The process is super easy and the finished result is almost too cute for words! If you are looking for a stuffed toy that is as big as your little one, you have to check out this DIY stuffed manatee that you make from an old t-shirt. You use a large t-shirt for this one, if you want to make the manatee really big, that is. 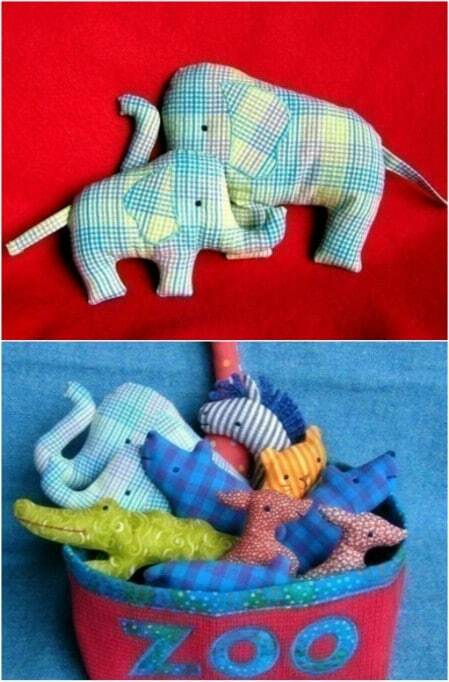 This is a great way to upcycle old t-shirts and turn them into fun and exciting toys for your kids. 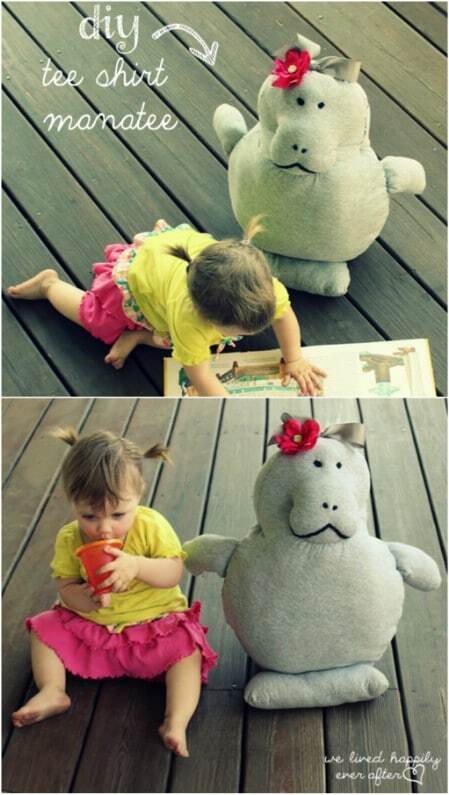 Plus, this is honestly one of the easiest DIY stuffed toy projects that I have seen. What a great way to refashion an old t-shirt! These DIY hand drawn stuffed animals are really easy to make and the best part is, they are totally unique. You draw them out yourself so they are your design and yours alone. You could get your little ones to draw out their favorite animals and use those designs, as well to make them really special. Once you have the drawing, the rest of the process is really easy and you end up with DIY stuffed animals that are one of a kind. With this pattern, you don’t just get one stuffed animal – you get an entire zoo! This pattern is over on Etsy and it’s about $14, but for that price you get every zoo animal that you can imagine and then some. You get a giraffe, elephant, baby elephant, tiger, kangaroo, zebra, bear and so many other adorable little animals. 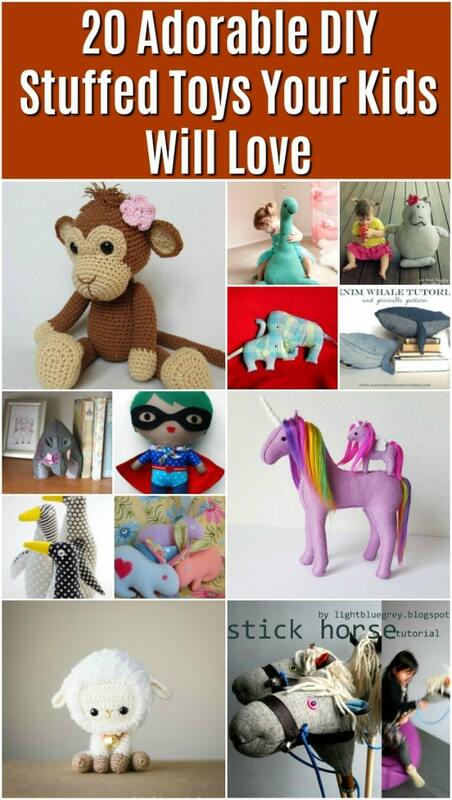 You can use the pattern to create as many zoo animals as you want!